A prospective, multi-center, randomized controlled study was conducted to evaluate the efficacy and safety of a 24-week course low-dose leflunomide combined with prednisone in the induction treatment of proliferative lupus nephritis in Chinese patients. Patients (n = 100) with biopsy–proved proliferative lupus nephritis were enrolled in this study. They were randomized into two groups and received either leflunomide or cyclophosphamide in conjunction with prednisone for 24 weeks. Leflunomide was given orally with a loading dose of 40 mg/day for 3 days followed by 20 mg/day. Intravenous cyclophosphamide was administered monthly at a dosage of 0.8–1.0 g. The primary efficacy outcome was the frequency of complete remission and partial remission at week 24. The secondary outcomes included changes of urinary protein excretion, serum albumin, complement 3, anti-dsDNA antibody level, and systemic lupus erythematosus disease activity index (SLEDAI) after 24-week therapy. Of 100 patients, 48 received leflunomide combined with prednisone and other 52 received cyclophosphamide with concomitant prednisone. There were no statistically significant differences between groups in complete remission rate and partial remission rate. At week 24, 23% of patients in the leflunomide group and 27% of patients in the cyclophosphamide group achieved complete remission (P = 0.64), while 56% of patients in the leflunomide group and 42% of patients in the cyclophosphamide group achieved partial remission at week 24 (P = 0.16). SLEDAI, serum albumin, complement 3, anti-dsDNA antibody level, and urinary protein excretion improved significantly in both groups. No significant difference was seen in the changes of clinical parameters after therapy between the two groups. There was no significant difference in side effects in both groups. Compared with cyclophosphamide, low-dose leflunomide in combination with prednisone showed both effectiveness and safety in the induction therapy of proliferative lupus nephritis in Chinese patients. Minfang Zhang and Chaojun Qi contributed equally to this work. Systemic lupus erythematosus (SLE) is an autoimmune disorder often involving multiple systems . Lupus nephritis (LN), one of the most common complications of SLE, accounts for the most morbidity and mortality [2, 3]. Cyclophosphamide combined with glucocorticoids had been chosen as standard therapy in the induction treatment of lupus nephritis since the 1970s [4, 5, 6]. Recent randomized clinical trials showed that mycophenolate mofetil was as effective as cyclophosphamide in inducing remission of LN during the initial phase of therapy [7, 8]. Mycophenolate mofetil therefore is now commonly recommended as first-line therapy in LN [9, 10, 11]. In Asian patients, the response rate to intravenous cyclophosphamide was similar to that of mycophenolate mofetil , but nearly two times as many patients in the mycophenolate mofetil group withdrew because of adverse effects than the cyclophosphamide group in the largest clinical study and there were more deaths in the mycophenolate mofetil group . Consequently, there is a need to find an alternative approach to LN treatment that is as effective as mycophenolate mofetil and with fewer severe adverse effects than mycophenolate mofetil. Leflunomide, an inhibitor of dihydroorotate dehydrogenase, has antiproliferative and anti-inflammatory actions by leading to a decrease of T cell and B cell. 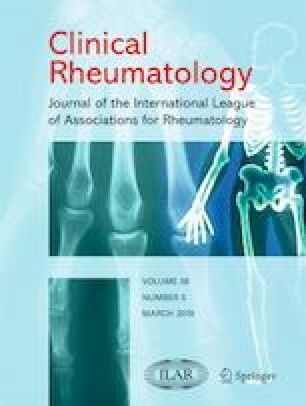 Leflunomide is a novel immunosuppressive agent used in the treatment of rheumatoid arthritis as a disease-modifying anti-rheumatic drug [12, 13, 14]. It has been proven that leflunomide is as effective as methotrexate in the treatment of rheumatoid arthritis and is well-tolerated . There are some reports and studies indicating that leflunomide is safe, well-tolerated, and may be effective in SLE patients [16, 17]. Leflunomide has also been explored for treatment of glomerulonephritis. It was reported to be effective in reducing the proteinuria in idiopathic membranous nephropathy and IgA nephropathy [18, 19]. Several studies explored the effectiveness of leflunomide in the induction therapy of LN patients. The results of these studies indicated that the efficacy of leflunomide combined with glucocorticoid was comparable to cyclophosphamide [20, 21]. A systemic review concluding 11 RCTs and a total of 254 patients evaluated the efficacy and safety of leflunomide compared to cyclophosphamide in adult patients with LN . Results showed that leflunomide was superior to cyclophosphamide in achieving complete and total remission, but no difference in systemic lupus erythematosus disease activity index (SLEDAI) score was found between these two treatments. What’s more, leflunomide was found to be safer than cyclophosphamide regarding adverse drug reactions (ADRs), including liver damage, alopecia, leukopenia, and infection. This meta-analysis of RCTs suggested that leflunomide is a promising therapy for LN treatment, primarily because of the comparable efficacy and favorable safety profile. The dosage of leflunomide given to patients was different, from 20 to 50 mg/day. Some studies evaluated the efficacy of low-dose leflunomide (20 mg/day) in rheumatoid arthritis. However, study about the effectiveness of low-dose leflunomide in LN is sparse. We, therefore, undertook a randomized, prospective observational multi-center study to investigate the efficacy and safety profile of low-dose leflunomide compared with cyclophosphamide in the treatment of patients with biopsy–proven proliferative lupus nephritis. Patients with LN were enrolled from 15 centers across China between November 2013 and November 2015. All patients were diagnosed as SLE according to the criteria of the American College of Rheumatology in 1997 , with a SLEDAI ≥ 8. All of them had biopsy–proved diffuse proliferative or focal proliferative lupus nephritis (International Society of Nephrology/Renal Pathology Society, 2003 Type IV A or A/C and Type III A or A/C) , with or without membranous nephropathy. The renal biopsy should be done within 6 months before randomization. Pathological activity index (AI) of every patient enrolled in this study was no less than 4. Patients who had received any immunosuppressant (such as cyclophosphamide, mycophenolate mofetil, cyclosporin, tacrolimus, leflunomide, methotrexate, and biologics) within the previous 1 month were excluded. Patients who had received high-dose steroids within the previous 1 month were also excluded. Other exclusion criteria were severe infection which need intravenous antibiotics, cerebral lupus, liver disease, malignant tumor, pregnancy, anticipated poor compliance with the protocol, and age < 18. Patients with antiphospholipid syndrome or with positive antiphospholipid antibodies were also excluded in this study. The study was approved by the Chinese State Food and Drug Administration (2011L01968) and the ethics committees of Renji Hospital, School of Medicine, Shanghai Jiaotong University, and informed consent was obtained from each patient. Renal biopsy specimens were evaluated (immunofluorescence and light microscopy) by renal pathologists at each center, and categorized according to the ISN/RPS classification system. Those specimens were re-examined blindly by experienced pathologists in central laboratory to re-assess the diagnosis and evaluate the pathological indices of activity. Renal activity index (AI) scores were assessed according to Austin et al. . The central randomization system provided by the department of epidemiology and health statistics, Nanjing Medical University, was used for randomization in the study. Investigators from each center enrolled participants. Immediately after informed consent was obtained, investigator logged into the central randomization system, obtained random number, and got the intervention plan. Thus, patients were randomized to the two treatment groups: leflunomide or cyclophosphamide. Leflunomide tablets (drugs were provided by Fujian Huitian Biological Pharmaceutical Co., ltd.) were given at an initial loading dose of 40 mg/day for 3 days and followed by 20 mg/day for 24 weeks. Intravenous cyclophosphamide was administered monthly for 6 months at a dose of 0.8–1.0 g monthly. All patients were given a dose of 0.8–1.0 mg/kg/day prednisone for 8 weeks. Dosage of prednisone was tapered by 5–10 mg every 2 weeks until 20 mg/day and then 2.5 mg every 2 weeks until a maintenance dose of 10 mg/day was reached. Prohibited medications include immunoglobulin and plasma exchange. If patients had been using hydroxychloroquine or ACE inhibitors before enrollment, these drugs could be used with the original dose during this study. The duration of the study was 24 weeks. During the follow-up period, patients were closely monitored for various clinical parameters and adverse events, every 2 weeks for the first month and then every 4 weeks for the remaining 20 weeks. The parameters included urinary protein excretion, urinalysis, white blood cell, hemoglobin, blood platelet count, serum creatinine (Scr), serum uric acid, blood urea nitrogen and liver functions, erythrocyte sediment rate, and C-reactive protein (CRP). Serum complement 3 (C3), complement 4 (C4), and anti-double-stranded DNA (anti-dsDNA) antibodies were also measured. Anti-nuclear antibody (ANA) and SLEDAI was evaluated at 0, 12, and 24 weeks. The titer of serum antibodies against double-stranded DNA (dsDNA) was determined by using radioimmunoassay (EUROIMMUN AG, Germany). ANA was detected by using an indirect immunofluorescence method. The normal range of anti-dsDNA antibody titers was less than 7 IU/mL. The normal range of C3 and C4 was 0.9–1.8 g/L and 0.1–0.4 g/L. Estimated glomerular filtration rate (eGFR) was calculated using the modification of diet in renal disease (MDRD) formula. The primary endpoints were complete remission and partial remission at 24 weeks. The secondary endpoints were response of clinical parameters and side effects. Complete remission was defined as urinary protein excretion less than 0.3 g/day, with normal urinary sediment (RBC < 5/HP, WBC < 5/HP), with normal serum albumin concentration and stable renal function (percent change in creatinine less than 15% from baseline). Partial remission was defined as any one of the following features: decrease of urinary protein excretion by more than 50%, with a serum albumin level ≥ 30 g/L and stable renal function. Treatment failure was defined as any of the following: increase of the serum creatinine level by 15% from baseline; urinary protein excretion > 3 g/24 h; failure of urinary protein excretion to improve by 50% with serum albumin level < 30 g/L. The sample size necessary to detect a significant difference (π = 80%, α = 0.05, two-sided) was calculated to be 180 on the basis of 0.8 power according to Fisher’s exact test. Normally distributed data were presented as mean and standard deviations, while non-normally distributed variables were expressed as median and quartile. The Student T or Mann-Whitney U test was used to compare the variables between two groups when necessary. The comparison of all categorical variables such as frequency or percentage (%) was performed using either the chi-square or Fisher’s exact tests. Intention-to-treat analysis was performed on primary outcome. SPSS 19.0 software was used for statistical analysis. All statistical tests were two-sided and significance was defined as P < 0.05. A total of 100 patients were included in the study, 48 in the leflunomide group and 52 in the cyclophosphamide group. The age of patients ranged from 21 to 61 years old. There were no significant differences in age, gender, serum creatinine, estimated glomerular filtration rate, urinary protein excretion, serum albumin, complement 3 level, and SLEDAI between the leflunomide group and cyclophosphamide group (Table 1). Renal pathological assessment showed that there was no significant difference in pathological type and AI score between the two groups (Table 1). Twenty-eight patients (53.8%) in the cyclophosphamide group and 26 patients (54.1%) in the leflunomide group had nephrotic range proteinuria. Seven patients (13.5%) in the cyclophosphamide group and 12 patients (25%) in the leflunomide group had elevated creatinine at baseline. Of the 100 patients recruited, 90 patients finished the 24-week study. Ten patients did not complete this study (four in the leflunomide group and six in the cyclophosphamide group), and they were dealt with as treatment failure in the intention-to-treat analysis (Fig. 1). After 24-week treatment, no difference between the leflunomide and cyclophosphamide groups was addressed with respect to clinical outcome (Table 2). Moreover, we did not find significant difference in time to achieve partial remission between the leflunomide group and the cyclophosphamide group (11.0 ± 6.5 vs. 10.6 ± 6.7 weeks, P = 0.737). Patients in both the cyclophosphamide and leflunomide groups showed significant improvement in disease activity markers. Urinary protein excretion, anti-dsDNA antibody level, and SLEDAI decreased significantly both in leflunomide and cyclophosphamide group. Serum albumin level and serum complement 3 level increased significantly in both groups (Table 3). Serial values for urinary protein excretion (Fig. 2a), serum albumin (Fig. 2b), anti-dsDNA antibody concentration, serum complement 3 level, and SLEDAI were similar in the two groups (Fig. 3a–c). The magnitude of changes in serum albumin, 24-h urine excretion, serum complement 3, anti-dsDNA antibody level, and SLEDAI has no significant difference between the two treatment groups (P > 0.05). 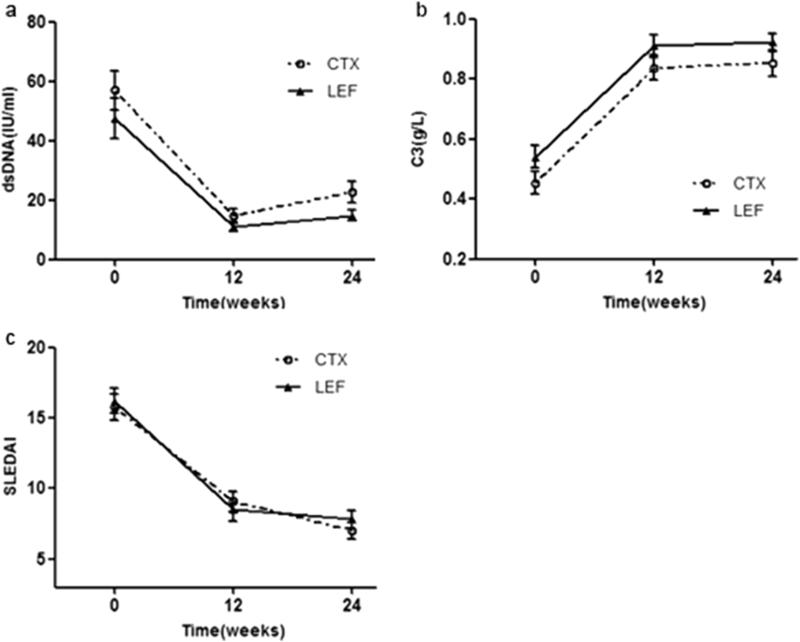 Changes of mean (± SD) urinary protein excretion and serum albumin in patients with proliferative lupus nephritis treated with leflunomide or cyclophosphamide for 24 weeks. 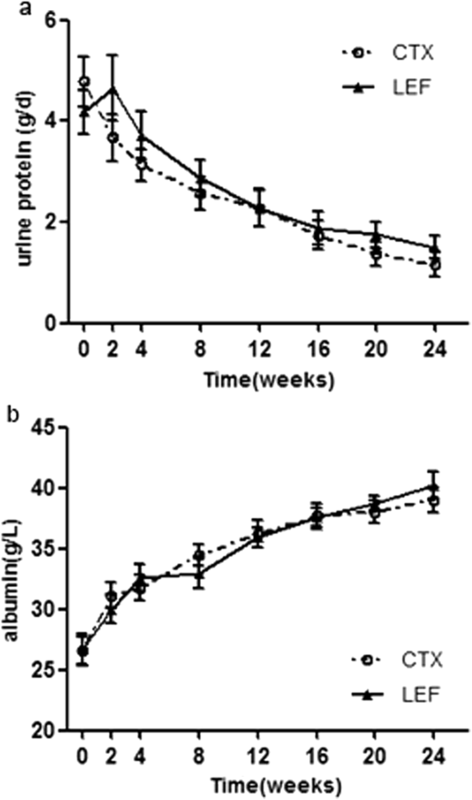 In both groups, urinary protein excretion decreased gradually after treatment. The mean urinary protein excretion (a) decreased significantly after 8 weeks of therapy, and it remained significantly lower at the end of study (P < 0.05). The mean serum albumin (b) was significantly higher than the baseline value, and it remained significantly higher at the end of study (P < 0.05). There was no significant difference in the rate of adverse events between two groups (Table 4). The most common adverse event was infection in both groups. There were 18 episodes of infection in cyclophosphamide group and 16 episodes in patients treated with leflunomide. Upper respiratory infection was the most common infection in both groups. Herpes zoster happened in three patients in the cyclophosphamide group and in one patient in the leflunomide group. One patient who had herpes zoster in the cyclophosphamide group discontinued her treatment because of the adverse event. One patient died in the leflunomide group because of suicide. Though the suicide patient had achieved complete remission during the treatment period, she got depressive disorder after the disease onset. We also noticed that the incidence of abnormal liver function in the leflunomide group was higher than that in the cyclophosphamide group, but the difference was not significant. All patients with impaired hepatic function were relieved after treatment with hepatoprotective drugs. Though there was no significant difference between the two groups, menorrhea and nausea happened less in the leflunomide group (0 episode and 1 episode) compared with cyclophosphamide group (2 episodes and 5 episodes). SLE is a relapsing autoimmune disease predominantly affecting women of childbearing age. Lupus nephritis is one of the most serious manifestations accounted for poor outcome. Since treatment requires long-time therapy, it is crucial not only to define medicines that are effective but minimize toxicity . Currently, the main immunosuppressive regimens recommended for therapy of lupus nephritis include mycophenolate mofetil, cyclophosphamide, and azathioprine [10, 11], but adverse drug reactions such as infection, leucopenia, and liver damage occur in many patients leading to increased morbidity and mortality. Therefore, more effective drugs with favorable safety profile are needed. Leflunomide, as an immunosuppressive regimen, was confirmed to be as effective as methotrexate and sulfasalazine in the treatment of rheumatoid arthritis in 1998. Since it was approved by the US Food and Drug Administration to be used in rheumatoid arthritis, leflunomide has been increasingly used in clinical applications . As an immunosuppressive regimen, leflunomide has an inhibition effect on proliferation and activity of B and T cell, making it a reasonable candidate for treatment of LN. Some experimental models  and clinical studies  have showed that leflunomide has an obvious ameliorative effect against SLE and LN. In chronic graft-versus-host disease (cGVHD) mice model, compared with an untreated group, oral leflunomide administration for several weeks could increase survival, reduce levels of autoantibodies, and improve the histopathologic lesions by inhibition of TLR9 signaling pathway . A771726, the active metabolite of leflunomide, was proven to have therapeutic effects in murine LN. A771726 could inhibit the development of LN and attenuate the generalized autoimmune features by augmenting iTregs which suppress pathogenic IL-17-producing double negative T cells through an Akt-dependent mechanism in MRL/lpr mouse. In 2004, the first double-blind, randomized, placebo-controlled clinical study conducted in Hong Kong showed the effectiveness of leflunomide in the treatment of SLE. Twelve patients were enrolled in this study. Six patients were randomized to receive leflunomide and the other six received placebo. All patients received the same dosage of prednisolone during the study. Patients in the leflunomide group were treated with leflunomide orally, while patients in the placebo groups received placebo instead. After treated with leflunomide (a loading dose of leflunomide 100 mg daily for 3 days followed by leflunomide 20 mg daily for the remainder of the study)-combined prednisolone, the SLEDAI score reduced significantly in the leflunomide group . However, there was no significant difference between the two groups in the change of proteinuria. This might have resulted from only three of six patients treated with leflunomide with a mean proteinuria at 1 g/day that were recruited in this study. But after that, several studies showed that leflunomide was quite effective in the treatment of lupus nephritis . Wang et al. found that leflunomide and cyclophosphamide had similar efficacy and safety in the treatment of proliferative LN in 2008. A total of 110 patients were included in the study, 70 in the leflunomide group and 40 in the cyclophosphamide group. In their study, the therapy of leflunomide and prednisone induced complete remission in 21% of patients and partial remission in 52% within 6 months. Thus, 73% of leflunomide-treated patients had a significant improvement in their diseases, a response that was essentially identical to cyclophosphamide treatment . Besides, some patients in their study went through repeat biopsy to confirm the efficacy of leflunomide. Repeat biopsies performed in patients treated with leflunomide and prednisone and blindly reviewed showed that the decrease in AI paralleled the improving clinical indices. In the current study, the total remission rate was similar to that in Wang’s study. Seventy-nine percent of leflunomide-treated patients achieved partial or complete remission at the end of the study. After the 6-month treatment, proteinuria, serum albumin, and complement 3 level were significantly improved; serum creatinine stabilized or decreased. Significant decreases were seen in SLEDAI and anti-dsDNA antibody titers in the leflunomide group. Although this project is a small-scale study, a number of useful observations could be made from this study. The recommended dose of leflunomide in patients with rheumatoid arthritis is 20 mg daily , but the recommended dose of leflunomide is unclear in LN. The dose of leflunomide used in previous studies was from 20 to 50 mg daily. In this study, the dose of leflunomide is small when compared to that of the previous study (20 mg daily vs 30 mg daily) . Though the dose of leflunomide in this study is lower, there is no significant difference in efficacy. Our study showed that low-dose leflunomide is also safe and cost-effective compared with cyclophosphamide. The results suggested that low-dose leflunomide could be effective in the treatment of proliferative LN patients. In the current study, adverse events were common in both groups and the there was no significant difference between them. Major adverse events observed in the patients treated with leflunomide were similar to those in the cyclophosphamide group. We noticed that the percentage of patients with amenorrhea was lower in the leflunomide group compared with that of the cyclophosphamide group. This suggests that leflunomide might be safer than cyclophosphamide in the treatment of lupus nephritis. There are some limitations in our study. First, though the study was an open, multi-center, randomized controlled clinical trial, the number of patients enrolled in this study was still not large enough. The patients enrolled in this study were from the same race, so the results may not be generalized in other races. The study was not blinded due to the form of leflunomide and cyclophosphamide. Second, the number of patients enrolled is not big enough. Because the time of the study was limited, we did not include enough patients. Third, we did not observe the efficacy of leflunomide in the maintenance therapy in these patients with proliferative LN. We need to make long-term follow-up to these patients. Third, patients in our study have no biopsy after treatment to evaluate the pathological change. In summary, low-dose leflunomide combined with glucocorticoids was effective in the induction treatment of proliferative lupus nephritis in Chinese patients, and the efficacy and safety was similar to cyclophosphamide. Leflunomide was generally well-tolerated; however, precautions are needed to be taken during the leflunomide treatment to monitor infections especially when larger dosage of steroids was used concomitantly. Long-term, randomized studies are needed to elucidate the efficacy and safety of leflunomide in treating lupus nephritis. Drugs were provided by Fujian Huitian Biological Pharmaceutical Co.,ltd. Thanks to all the members that participated in this clinical trial from multi-centers: nephrologists from Guizhou Provincial People’s Hospital; Fuzhou General Hospital of Nanjing Military Command; The Second Hospital of Jilin University; Wuxi People’s Hospital; the First Affiliated Hospital of Fujian Medical University, Fuzhou, China; The First Affiliated Hospital of Nanjing Medical University; Peking University Third Hospital; Xin Hua Hospital Affiliated to Shanghai Jiaotong University School of Medicine; The First Bethune Hospital of Jilin University; The First Affiliated Hospital of Nanchang University; The First Affiliated Hospital, College of Medicine, Zhejiang University; Zhongshan Hospital, Xiamen University; Shenjing Hospital of China Medical University. MZ and CQ analyzed and interpreted the patient data. YZ, JC, PL, LW, ZS, JW, CX, SW, GJ, MS, QC, JC, TG, and DL screened subjects into groups and did follow-up work. MZ was a major contributor in writing the manuscript. ZN designed the study and helped to revise the manuscript. All authors read and approved the final manuscript. The study was approved by the Chinese State Food and Drug Administration (2011L01968) and the ethics committees of Renji Hospital, School of Medicine, Shanghai Jiaotong University, and informed consent was obtained from each patient.